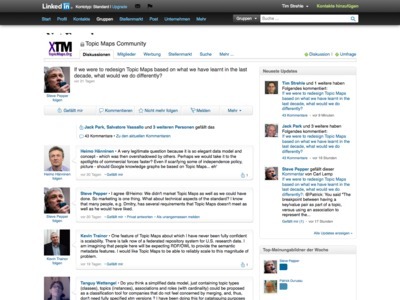 Steve Pepper started a (lengthy) discussion in the LinkedIn Topic Maps Community group – If we were to redesign Topic Maps based on what we have learnt in the last decade, what would we do differently? “In my opinion, the strength of topic maps is that they’re quite intuitive and easy to explain. When I’m modeling data, I’m thinking of topics (or subjects/objects/things) with names, classes, identifiers and arbitrary, repeatable properties (often literal values). And then about relations between topics, with relation types and roles. SQL database design made some of this rather hard, so I was very happy when I discovered topic maps back in the day. Reducing that model to “everything is an association” seems counter-intuitive to me. This reminds me of the RDF “everything is a triple” approach that is dumbing down data structures so much that it makes them harder to understand; see my blog. “Everything is a row in a database table” is on the same, not really helpful level. And as a programmer, I don’t look forward to such a change; simple property look-ups are faster and easier to implement when they don’t need to go through the whole association complexity.